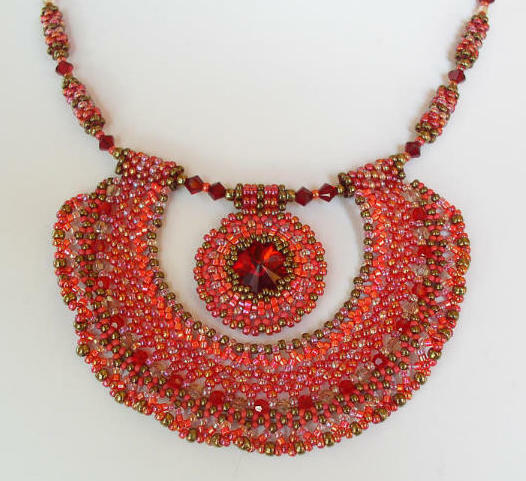 All of our beading instructions are much more than just beading patterns: they are complete sets of step-by-step instructions to make the finished jewelry shown in the photos, with bead patterns and a list of materials included. 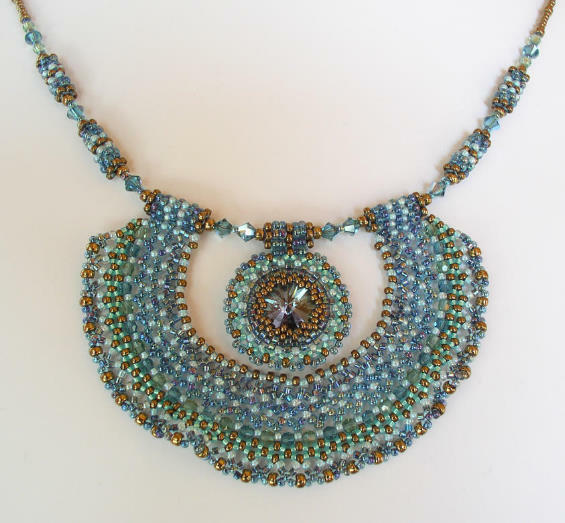 Remember that all of our projects started life as a bead kit, so they have been tested hundreds of times by other beaders. 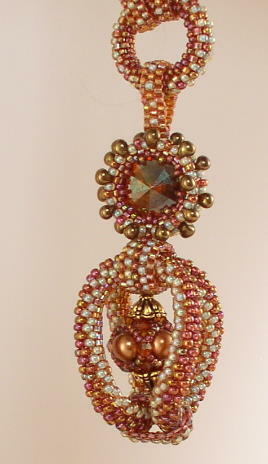 Victorian Pendant project. The instructions contain supply lists for all three color combinations shown. 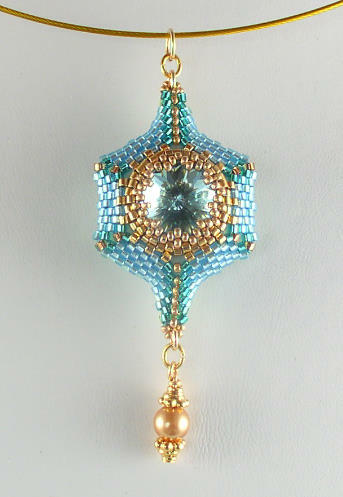 Features an elegant pendant and bail woven around a Swarovski rivoli, and a woven toggle clasp. The necklace is the classic "internet" spiral. 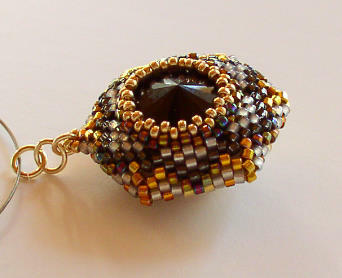 This is an intermediate beadweaving project. 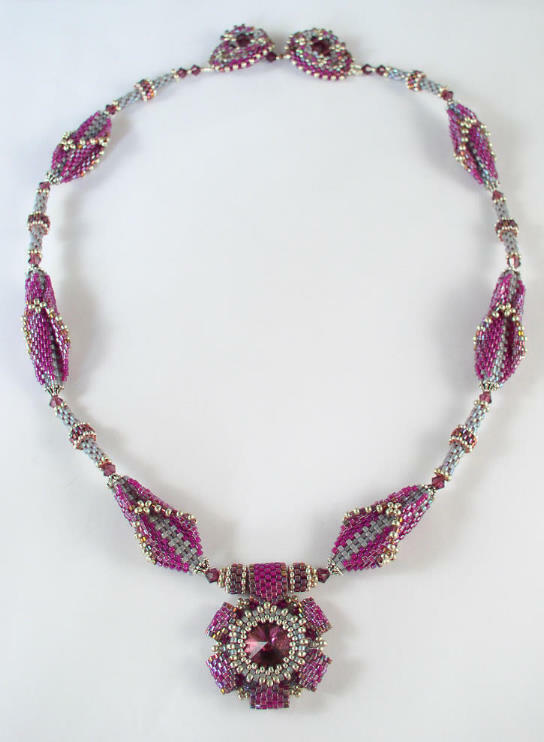 Art Deco II Santa Fe Beaded Bead Necklace project. 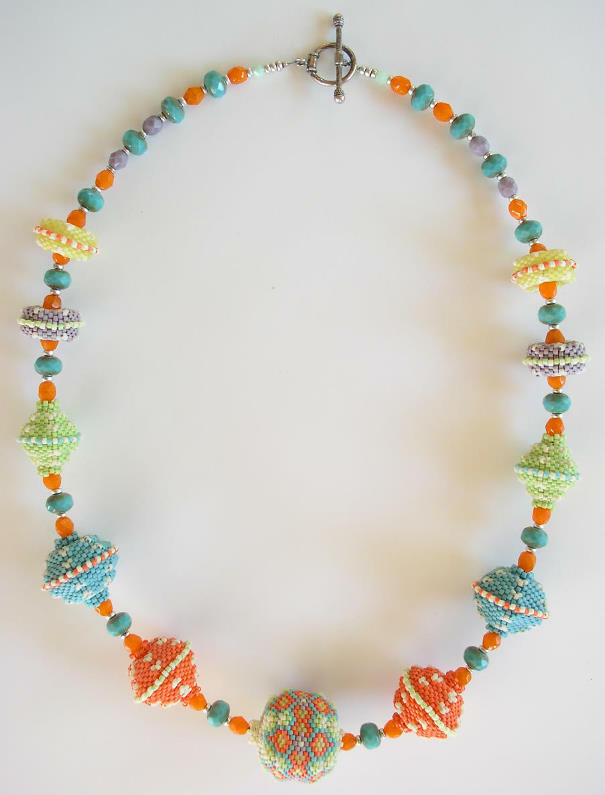 Features a collection of beaded beads in colors of the Southwest. 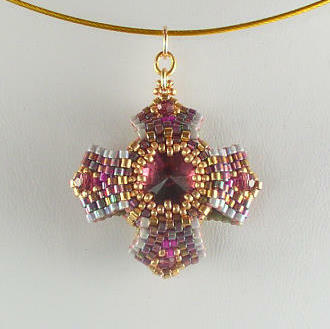 Uses tubular peyote stitch with a graphed centerpiece bead. 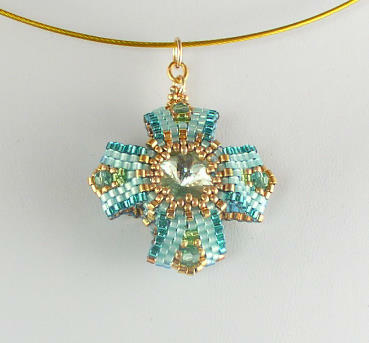 This project is for intermediate to advanced beaders. The sample shown at left is about 23 inches in length. 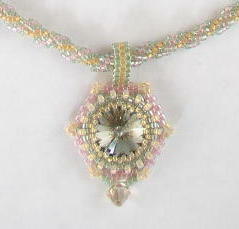 Lace Pendant Necklace project. The instructions contain supply lists for all three color combinations shown. 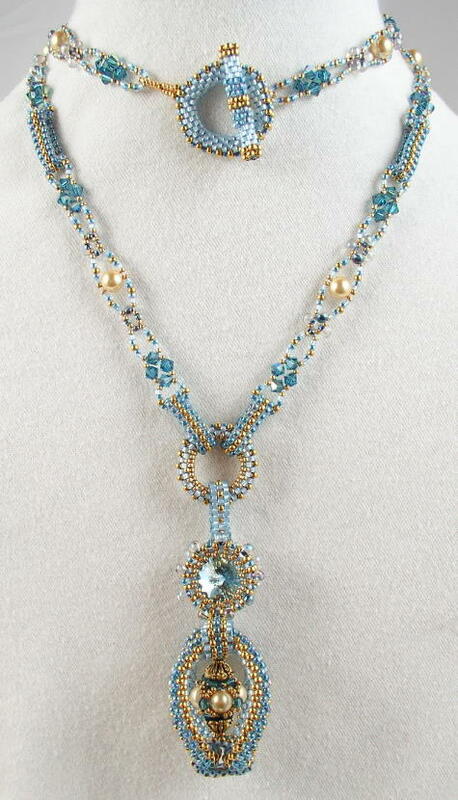 This necklace features beaded lace with a ruffled edge surrounding a beaded pendant with a center Swarovski rivoli. 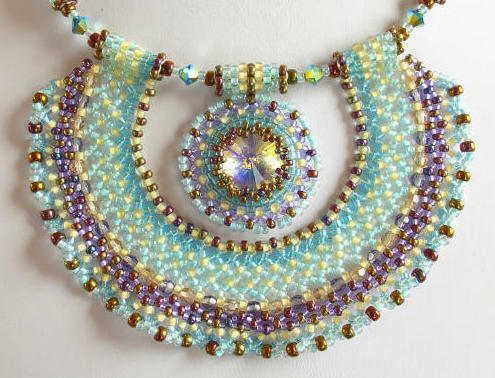 The necklace portion has beaded beads and Swarovski. 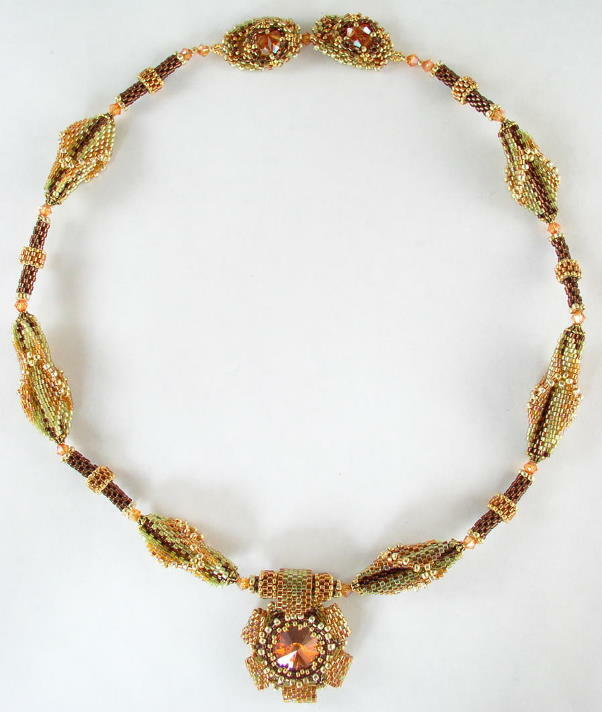 Uses horizontal netting, vertical netting, and circular peyote stitches. 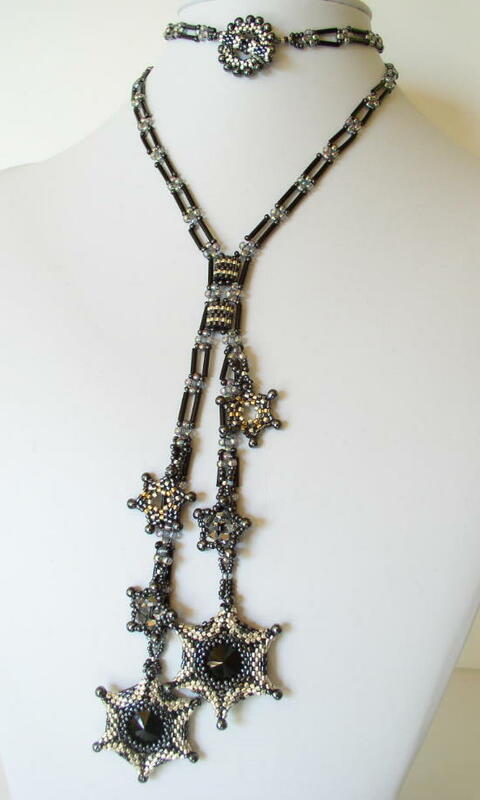 The necklace may be made up to 20 1/2 inches. The lace ruffle portion is 3 1/2 inches across. Fish Pendant Project. The instructions contain supply lists for all three color combinations shown. With a fully articulated body and tail, these pendants handle surprisingly like a real fish. 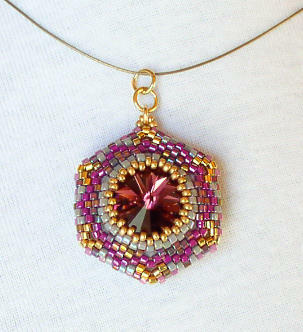 This is an advanced beadweaving project using Peyote, Brick, Herringbone, and Ladder stitches. 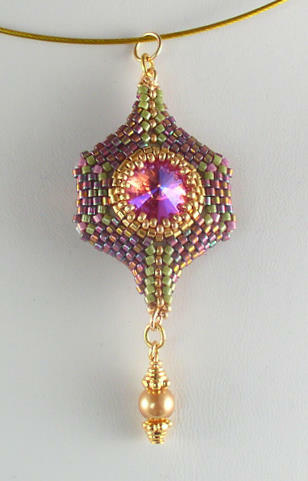 The finished pendant is about 3 1/2 inches in length, and about 5/8 inch in thickness. Tools required are chain nose pliers to open and close jump rings. 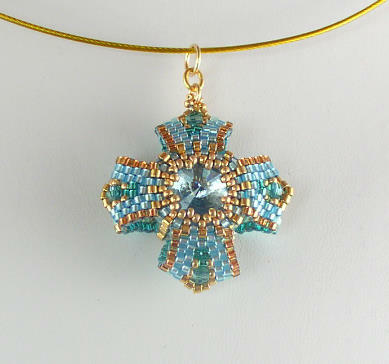 We have many more pages of Beadwork Projects. Please click on the buttons on the navigation bar above to see them. 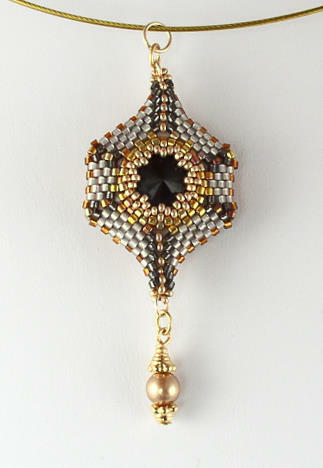 Reversible Pendant - Series One. 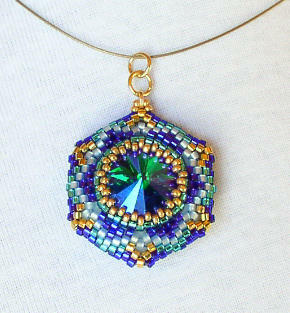 This pendant features a large Swarovski rivoli set in a intricate and colorful pattern of Delicas and other seed beads, with a different design on each side. The instructions contain supply lists for the four color combinations shown above. 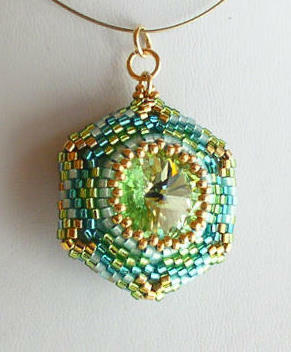 This is an intermediate beadweaving kit, using tubular and circular peyote stitches. 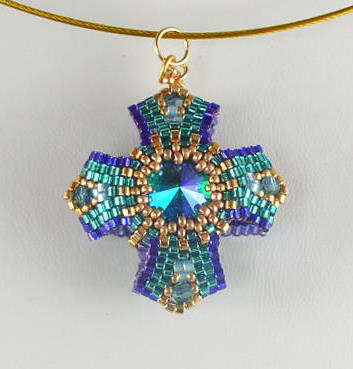 The pendant size is about one inch by one inch, and one-half inch in thickness. Tools required are chain nose pliers, to open and close jump rings. 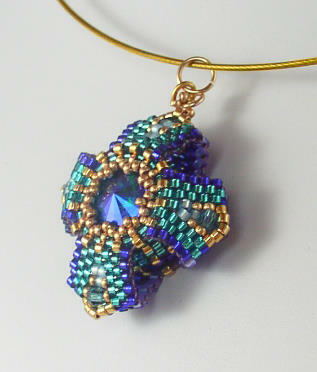 Reversible Pendant - Series Two. 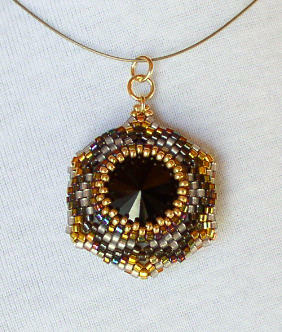 This reversible pendant necklace features a stretched hexagon shape with a Swaovski pearl drop. 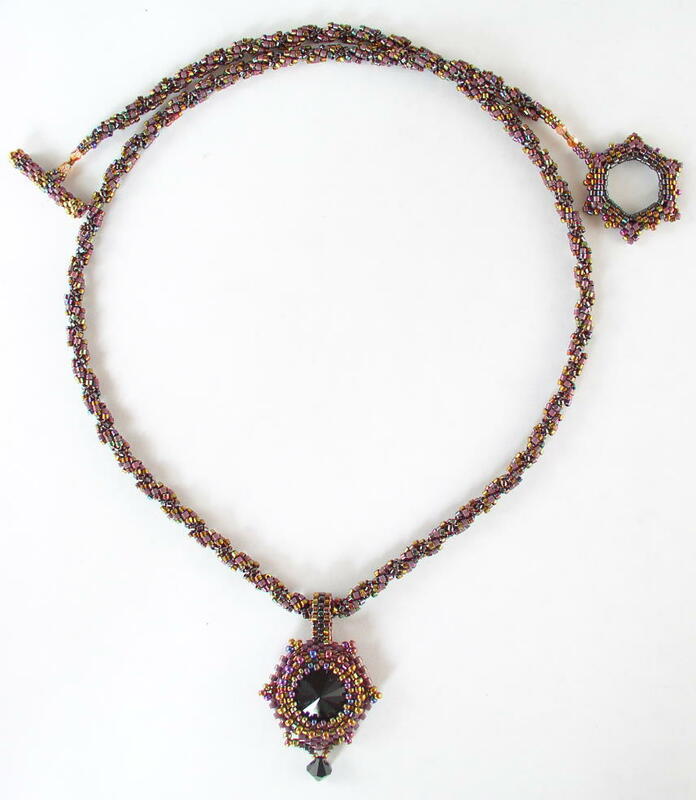 Each side has a large Swarovski rivoli set in a intricate and colorful pattern of Delicas and other seed beads, with a different design on each side. The instructions contain supply lists for the four color combinations shown above. 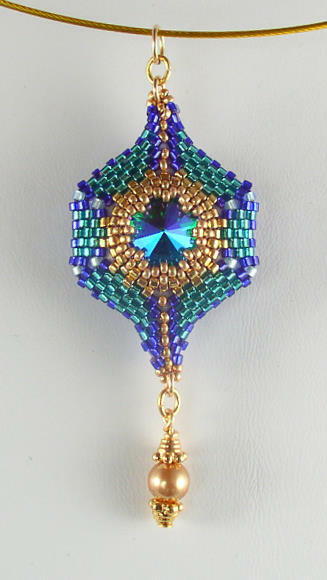 This is an intermediate beadweaving kit, using tubular and circular peyote stitches. 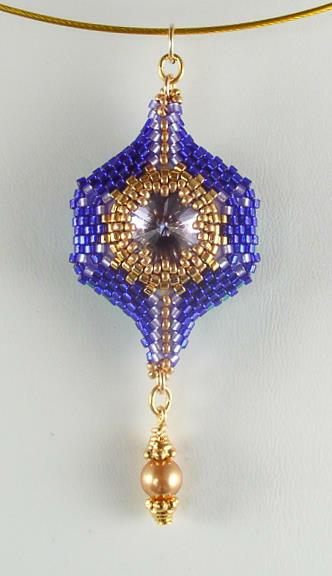 The pendant size is about 1 3/4 inches in length without the Swarovski pearl drop, by one inch wide, and one-half inch in thickness. Tools required: chain nose pliers, round nose pliers, and wire cutters. These reversible pendants are like having two necklaces in one. 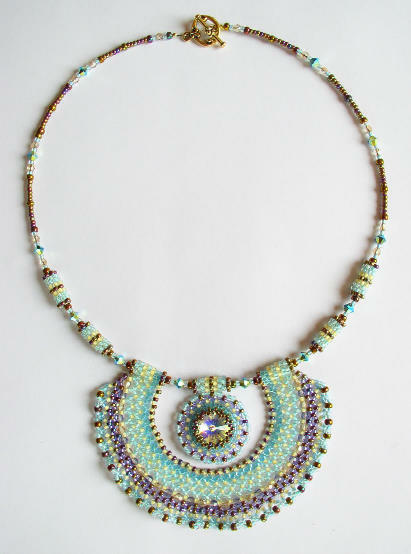 Each side features a large Swarovski rivoli set in a intricate and colorful pattern of Delicas and other seed beads. 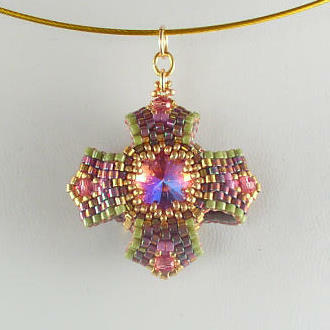 We offer three different reversible pendant designs, each in four different color combinations. 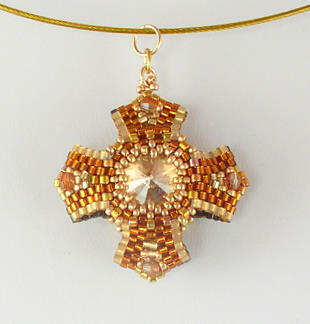 Reversible Pendant - Series Three. 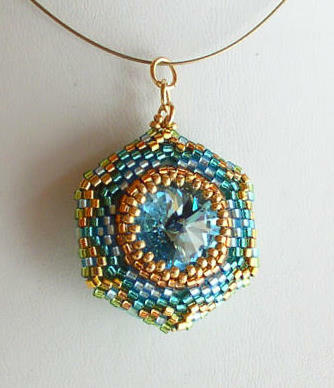 This pendant features a large Swarovski rivoli set in a intricate and colorful pattern of Delicas and other seed beads, with a different design on each side. The instructions contain supply lists for the four color combinations shown above. 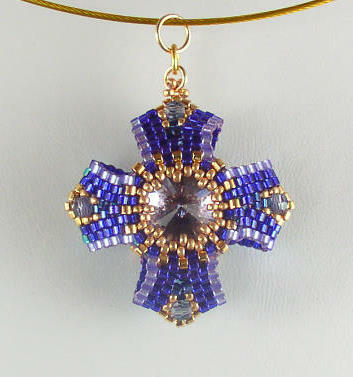 Starry Night Necklace project. The instructions contain supply lists for both color combinations shown. 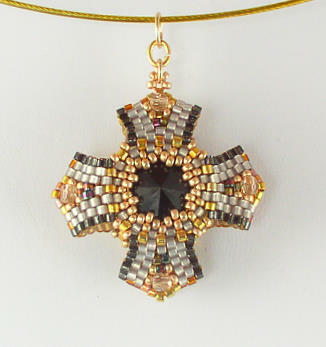 Features stars woven around Swarovski Rivolis. 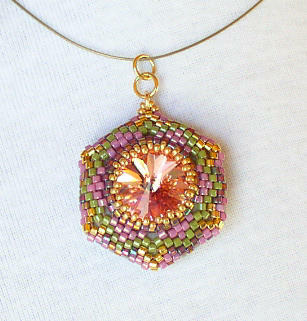 This is an advanced beadweaving project using right-angle weave, herringbone, circular peyote, and flat peyote stitches. The project is 26" in length, with a 7 1/2" fringe. 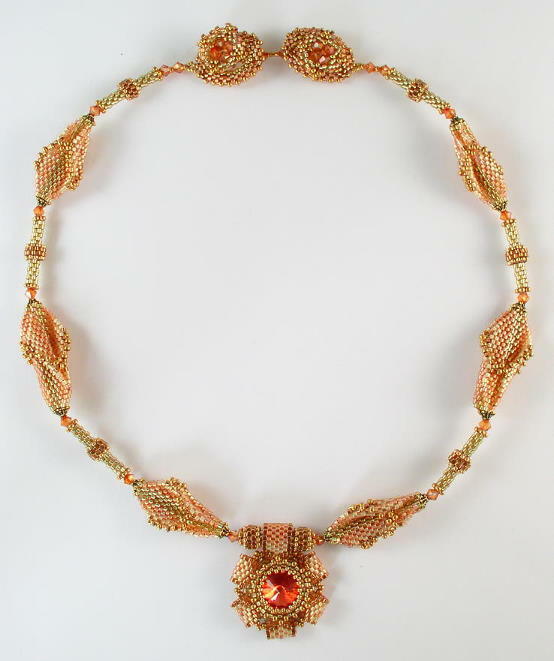 Rite of Spring Necklace . 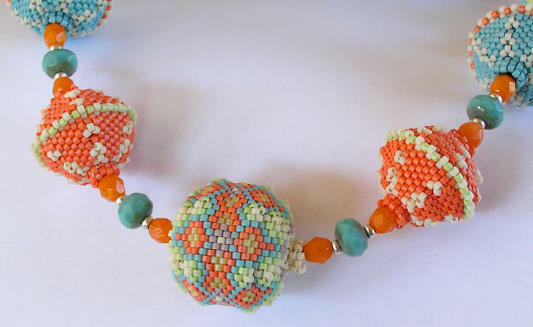 Working on this design made me think of petals unfurling, butterflies emerging, pinwheels spinning, seed pods bursting--all these signs of Spring suggested naming this necklace after the Stravinsky ballet. The instructions contain supply lists for the three color combinations shown. 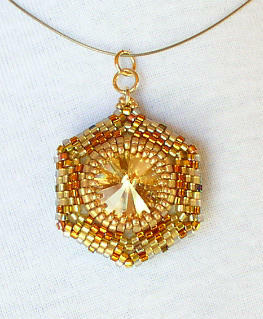 This necklace features Swarovski rivoli and spacers, and seed beads with gold and other precious metals. 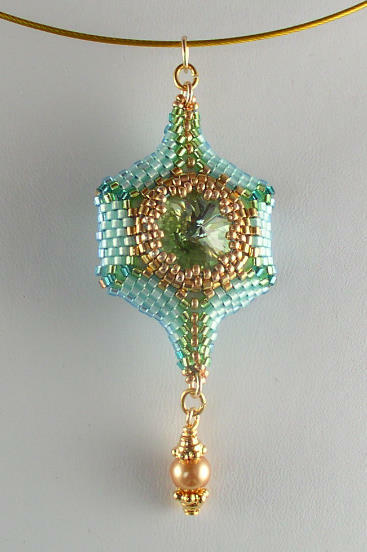 This is an advanced beadweaving kit, using peyote and other stitches. Up to 20" in length. 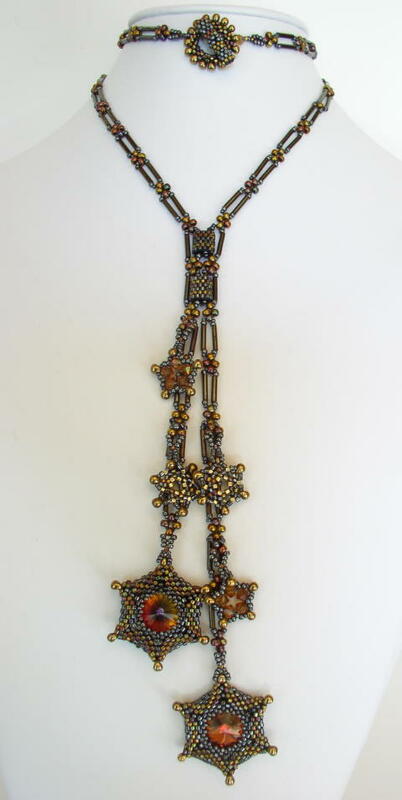 Caged Bead Necklace. 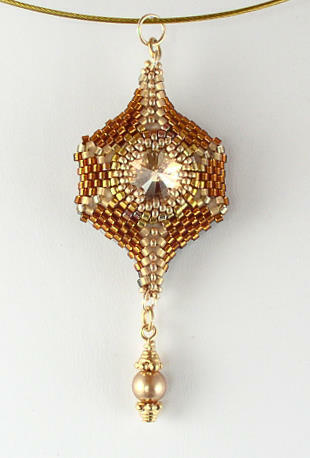 This design features a pearl and crystal jewel suspended in a 3-dimensional "cage." The instructions contain supply lists for the three color combinations shown. 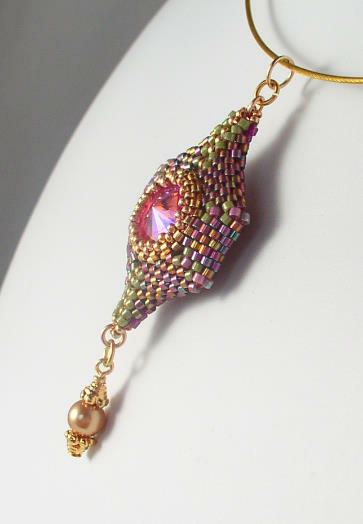 Features 24kt gold seed beads and Swarovski beads, rivoli, and pearls. 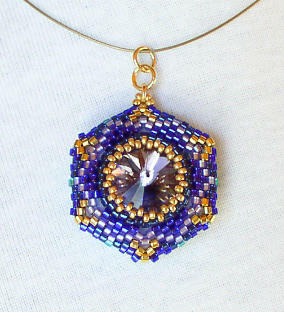 This is an intermediate to advanced beadweaving kit, using circular, tubular, and flat peyote stitches. 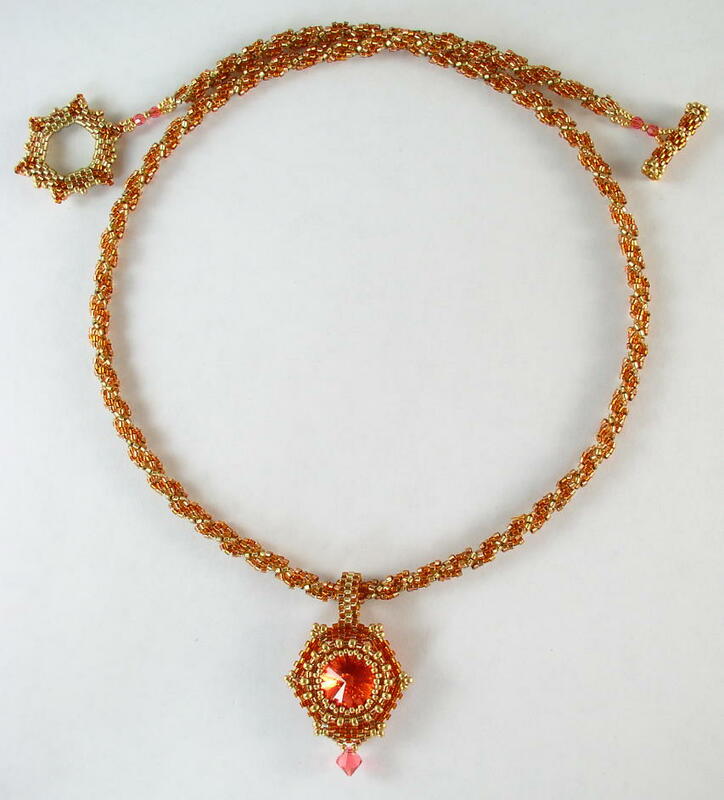 Up to 29 1/2" in length, and may be worn full-length or wrapped as shown in the photo.